Almost a quarter of the workforce is engaged in unpaid work for a community organisation during work hours, but these programs are not as effective as they could be, according to lecturers at Deakin Business School. The Centre for Sustainable and Responsible Organisations within the Deakin Business School is set to hold the Corporate Community Volunteering and Employee Engagement Think Tank in a bid to start a conversation around the issues. Representatives from the not-for-profit space, community organisations, volunteering bodies and for-profit organisations are being brought together to brainstorm ways of approaching the challenges of corporate volunteering. Dr Heather Round, a lecturer in management at Deakin Business School, told Pro Bono Australia News the university was hoping to make a contribution to the communities they serve. “Deakin as a university is looking very strongly at how we contribute to the communities we serve and thinking about that from the perspective of not only our research perspective, but what else can we do in terms of starting conversations which could lead to positive outcomes,” Round said. As part of the free session, taking place in Melbourne on Thursday, David A. Jones, from the Grossman School of Business at University of Vermont, will be talking about Insights from the Science and Practice of Corporate Volunteerism: Enhancing Stakeholder Value through Informed Program Design. Round said the first half would be focusing on what is working well and what are the positive outcomes of corporate volunteering, followed by a look at what is not working well. “So we are starting off with… giving some feedback from research. So we’ve got this expert we’ve flown out from the US and he’s done a lot of work around big volunteering programs in organisations like Google, Cisco, big American organisations and he’s had some fantastic results in terms of implementing those and showing that when a volunteering program is working well, we have better outcomes for the staff in terms of them being more connected with their organisation, they identify more with their organisation, they have greater levels of trust, they develop their skills so there is positive organisational outcomes,” Round said. “We know when it works well it is really good for the organisation. 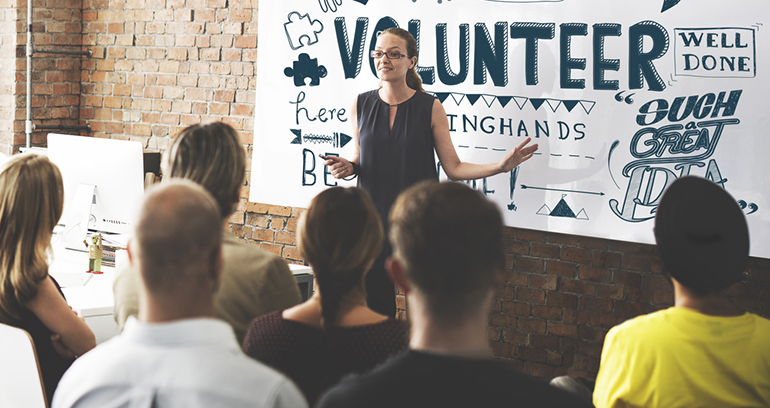 Round said community and not-for-profit organisations may feel overwhelmed by the influx of volunteers and may find it difficult to use all of their skills effectively. Employers may find it resource intensive to implement these type of programs, difficult to keep track of and challenging to pull together disparate volunteering efforts into a comprehensive story of the organisations commitment to volunteering and the community. “We have heard from different sources that sometimes the small not-for-profit organisations feel overwhelmed when they have a large corporation contacting them saying we’ve got people who want to come and volunteer, they actually can’t absorb those volunteers or we’ve got other situations where they’re maybe not using all the skills of the volunteers, so you might have somebody who is excellent at admin or IT or something and they come in and they stack envelopes for you and you go ‘well ok we’re not using their skills in the best way possible’,” she said. “So we know from the not-for-profit sector that sometimes it is not working. “We also know on the other side, in the corporate sector many of these people charged with running these type of programs say well ‘I don’t really know where to start, all I do is give my staff a day off to go volunteer, we don’t really measure it, we don’t monitor it, we don’t look at any positive impact’. Round said it would be interesting to examine some of the solutions working in the US and consider if they will work in the Australian context. “We do know some solutions from our colleague in the US, who is going to come and talk, so we do know there are some ways we could be more strategic about it and that it could work better, so we will offer some suggestions,” she said. “But we’re not assuming it is all going to work in our context, so we want to really discuss those options… and have a rich debate as to whether these will be useful within the context of Victoria and the context of Australia, because we are not assuming that what’s worked for Google and what’s worked in the US is going to necessarily work here. Round said she hoped here might be ramifications coming out of this session that they will be able to follow up on to actually improve the situation. “I suppose for me it is all about community,” she said. “We talk a lot at Deakin about the community we serve because we do see ourselves as being embedded in a broader community, thinking about how we give back. The upcoming session is open to anyone interested in volunteers. For more information see here.